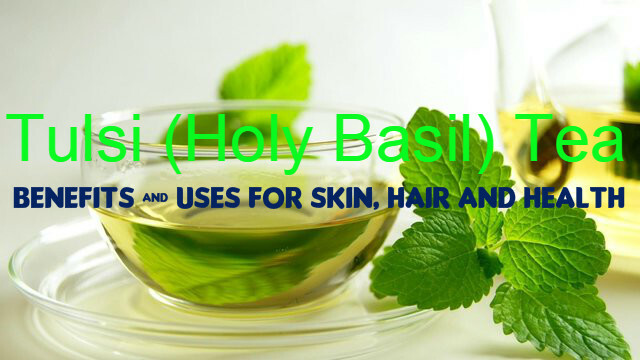 Tulsi or the Holy Basil is popular as the ‘Queen of Herbs’ in India and other South East Asian countries because of its various benefits. It also has religious importance. People in Asia have been using this herb for ages because of its therapeutic properties. Tulsi tea is known for its therapeutic and medicinal values. You can make this tea by adding tulsi leaves along with mild tea leaves. You may also add other spices and herbs with tulsi and make tea, depending on the kind of ailment you are suffering from. Tulsi tea, with its antioxidant properties, is a great tonic for your hair and skin and helps in keeping your hair and skin healthy and beautiful. The polyphones present in it are amazing for preventing the signs of ageing like the appearance of wrinkles, age spots and fine lines on the skin. Tulsi tea can also reduce itchiness on the scalp, thus helping in controlling hair fall. Tulsi tea can help you reduce weight naturally by acting on the metabolic rate of a person and burning extra fat in the body. You can lose weight easily and without much effort by consuming tulsi tea regularly. By consuming tulsi tea regularly you can make sure that the digestion of the protein, carbohydrates and lipid that you take-in are digested properly. It also aids in proper assimilation and absorption of these nutrients. Proper functioning of the liver is very important as it is an essential part for the digestive process. Consuming tulsi tea makes sure that your liver remains healthy and functions well. Tusi is great for giving a boost to your immune system as it has anti-biotic, anti-fungal and anti-inflammatory properties. So consuming this herbal tea is great for protecting your body from various infections and diseases. Tulsi tea can make you stay healthy and give you the strength to face even the worst conditions of weather. Often you suffer from headaches because of your busy schedule as well as due to sleep deprivation, odd working hours, eating disorders and so on. Consuming tulsi tea is an effective way to get relief from such headaches and to reduce stress and fatigue. The aroma of tulsi tea is said to have the ability to cure migraines and also get rid of other problems caused due to stress. Drinking tulsi tea is beneficial for those who suffer from fevers like dengue, malaria and so on. The anti-biotic properties of this herbal tea help in reducing fevers and also speed up your recovery from fevers. This it does by fighting against the microorganisms that are responsible for causing fevers and destroying them completely. Consuming tulsi tea regularly is very beneficial for those who are suffering from diabetes. It helps in lowering the levels of blood sugar in them. It also gives a boost to the metabolism of the body and uses the excess sugars to convert them into energy. This way it protects your body from the risk of high blood sugar levels. One of the major reasons for smoking is stress. Consuming tulsi tea helps in reducing stress and therefore you will be able to quit smoking. Tusli can help in destroying the germs and bacteria that are dwellings inside your mouth and on teeth, because of its antimicrobial properties. By consuming tulsi tea regularly, you can prevent various problems inside the mouth like ulcers, pyorrhea etc. Tulsi also plays the role of an effective mouth freshener and helps in preventing bad breath. But you must not chew the tulsi leaves directly because it can cause damage to the tooth enamel. Instead of chewing he leaves, you may have tulsi tea. This is as effective as chewing the leaves. Tulsi tea helps in preventing the formation of cancer cells in the body by removing toxic materials from the body. It is very effective for treating breast cancer and oral cancer because of its anti-carcinogenic properties. Magnesium is found in good amounts in tulsi tea. Magnesium is needed for ensuring proper flow of blood in the blood vessels and thus helps in preventing heart diseases. It is also effective for preventing the accumulation of cholesterol on the walls of the blood vessels. This way it can prevent any risk of arterosclerosis. So, by consuming tulsi tea regularly, you can lower the levels of blood cholesterol in your body. You can maintain the levels of cortisol, the stress hormone, in the body by consuming tulsi tea regularly. This tea also makes sure that there is proper flow of blood in the body and keeps you healthy and fresh. Tulsi tea is an amazing diuretic and detoxifier. By consuming tulsi tea regularly you can make sure that your kidneys stay healthy and function normally. It helps in preventing the production of excess uric acid by the kidneys. It is also very beneficial for treating kidney stones. It can break kidney stones and remove them. Consuming this herbal tea is good for getting relief from the pain associated with kidney stones. Tulsi tea can get you relief from mild cold and cough as well as bronchitis or severe asthma. It can greatly increase your immunity powers. The antitussive properties of this tea help in suppressing cough. It also has expectorant qualities, which help in removing phlegm. Tulsi contains camphene, cineole and eugenol essential oils, which can provide you relief from congestion in the chest. So, you can say that tulsi tea is an excellent home remedy for cough, cold and other respiratory problems. Tulsi tea is very effective for treating joint problems related with the joints like arthritis as it has anti-inflammatory properties. You will get relief from the inflammation and pain in the joints by consuming tulsi tea.